The above accolade and many others from historians were bestowed upon Emperor Ashoka, the third monarch of the Maurya dynasty, for many reasons. The fact that he brought much of India, Afghanistan and parts of Persia under one rule, while in itself is a feat unmatched by any other monarch in Indian history, is not why Ashoka qualifies as a luminary in the annals of world history. It has more to do with the way he governed and conducted himself as a benevolent ruler, who was not only concerned for his fellow citizens but also for the animals as well as the flora under his stewardship. The principles he espoused during his tenure as the emperor of his vast kingdom were well ahead of his time. In fact, many administrations in the "modern" 21st century world nations will fail miserably in the way in which they manage the welfare of their citizens, as well as the other denizens, and of the land itself. 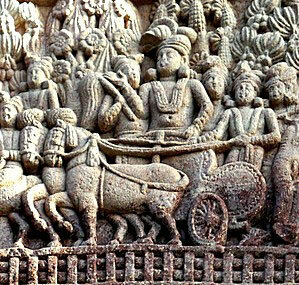 Ashoka is also credited with spreading the compassionate and enlightened religion of Buddhism, not only to all of India, but also to the rest of Asia, including some parts of “Middle Asia”. However, he was tolerant of all the other religions and treated them as equals. 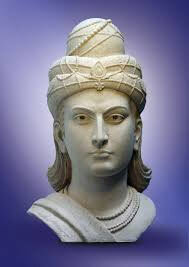 Ashoka was born in the year 304 BCE, as the grandson of Chandragupta Maurya, who started the Maurya Dynasty. From an early age Ashoka showed the traits of a great warrior, so much so, when rebellion broke in Ujjain, his father Bindusara dispatched him to quell it. Thus began Ashoka’s ascendancy. However, as his father Bindusara had chosen the eldest son Sushima to succeed him, there was a power struggle. Most of the ministers in Bindusara’s court did not favor Sushima, however, because they considered him too arrogant. These ministers, particularly one called Radhagupta favored Ashoka and thus, a council of ministers led by him installed Ashoka as the Emperor. 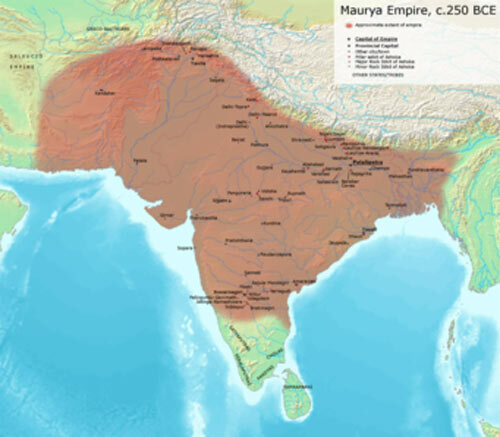 under the control of the Chera, Chola and Pandya kingdoms, were never conquered. The final war that Ashoka engaged in was the fateful “Kalinga war”. Kalinga (present day Odisha) was never before conquered by other kingdoms. After the particularly bloody war, Ashoka, having witnessed the death and destruction, had a change of heart. More that 100,000 soldiers were killed during this war, and the site of the war was filled with their corpses. Also, an additional 150,000 people were injured, and the city lay in ruins. Ashoka embraced the Buddhist religion and vowed never again to engage in wars; he would win the hearts of his subjects by his good deeds, instead. In addition to being an excellent warrior, Ashoka was an able administrator. All important matters of the state were discussed with his “Advisory Council”, which was comprised of the Yuvaraj (Crown Prince), Mahamantri (Prime Minister), Senapathi (General) and the Purohita (Priest). His empire was divided into Pradesha (Provinces), which in turn were divided into Vishyas (subdivisions) and these in turn into “Janapadas and villages”. The provinces were Uttarapatha (Northern Province) with Thakshasila as its capital, Avantiratha (Western Province), with Ujjain as its capital, Pracheyapatha (Eastern Province) with Toshali as its capital and the Dakshinapatha (Southern Province) with Suvarnagiri as its capital. 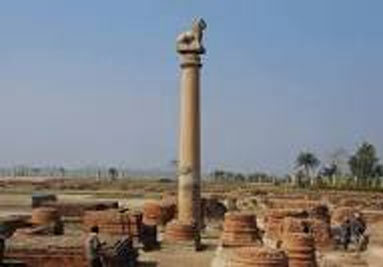 The empire’s capital was in Pataliputra (present day Patna). Each province was administered by a Crown Prince, who was transferred at frequent intervals to prevent them from becoming too powerful. In addition, Ashoka appointed several reporters who reported to him about the affairs of the Provinces. While the provinces were given a certain degree of autonomy, the emperor retained control over financial and administrative matters. Ashoka adopted Buddhism as the state religion of his empire and undertook the task of spreading the Buddhist teachings in India and abroad as his life’s mission. 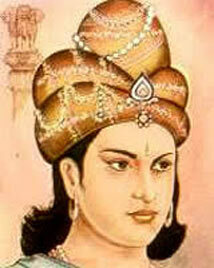 He sent his son Mahinda (Mahendra) and his daughter Sanghamitra to Sri Lanka (Tamrapani during Ashoka’s time). Missionaries were sent to places outside of India, such as Tibet, China, Japan and other East Asian and South Eastern countries. Also emissaries were sent to the Middle Eastern countries, Greece and Egypt. The Buddhism that spread to East Asia became known as Mahayana Buddhism, and the branch that spread to Sri Lanka and Thailand is known as Theravada Buddhism, (Please check our section at www.indiancentury.com/hist5.htm). History would record that his efforts yielded good results, as most East Asian countries officially or unofficially adopted Buddhism as their state religion as well. Similarly, the countries bordering India also became majority Buddhist countries and remain so even today. These countries are Sri Lanka, Bhutan, Myanmar (formerly Burma) and Tibet. The greatest irony in the annals of Buddhism is the fate that befell it in India. Within a few centuries after Ashoka declared Buddhism as the state religion and most of India adopted it, Hinduism had a resurgence. Ever since, Hinduism has remained dominant in India. In fact, Hinduism actually adopted the Buddha as an Avatar of Vishnu, a blatant attempt to absorb Buddhism into Hinduism. During the rest of his reign, Ashoka spent a great deal of time and resources in spreading the compassion and universal love preached by the Buddha. In this process, the erection and the inscriptions known as ‘Edicts’ would play a major role. 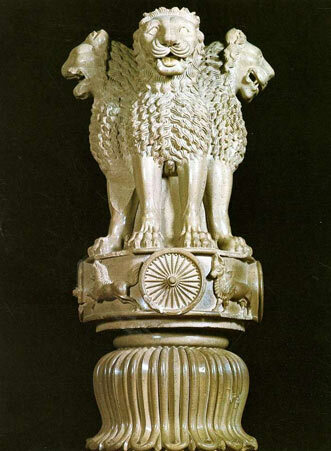 These Ashoka pillars were erected all across his empire. The pillars were constructed with stone and finely polished, each pillar weighing 50-100 tons. 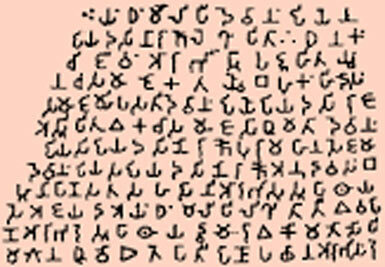 The inscriptions were in the Brahmi script. On the top of each pillar was a ‘capital’, of which, the four lion capital (four lions with their backs to one another) in Sarnath is the most spectacular. 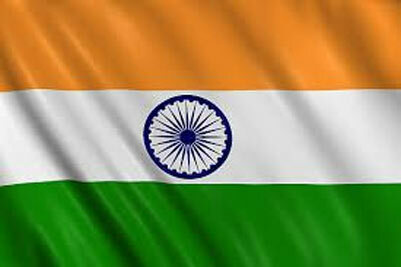 This has been adopted as the State Emblem of India. These inscriptions were personal messages from the Emperor to his subjects and they were meant to give guidance in creating a more just, more spiritually based society, both as a whole and individually. His tone in these Edicts was not bombastic and dry, like the usual royal proclamations. Instead, Ashoka used a personal tone, addressing his subjects as his children and himself as “Beloved-of –the –Gods”. In some of the Edicts he apologized to his people for the Kalinga war and asserted his desire not to have conflicts with his neighbors. In other words, mutual respect and peaceful coexistence between the kingdoms outside of his domain were stressed. Edict #1: “Beloved-of-the-Gods, King Piyadasi, has caused this Dhamma edict to be written. Here, (in my domain) no living beings are to be slaughtered or offered in sacrifice. Nor should festivals be held, for Beloved-of-the-Gods, King Piyadasi, sees much to object to in such festivals, although there are some festivals that Beloved-of-the-Gods, King Piyadasi, does approve of”. Edict #2: “Everywhere within Beloved-of-the-Gods, King Piyadasi’s domain, and among the people beyond the borders, the Cholas, the Pandyas, the Satiaputras, the Keralaputras, as far as Tamraparni and where the Greek King Antiochos rules, and among the kings who are neighbhors of Antiochos, everywhere has Beloved-of-the-Gods, King Piyadasi, made provision for two types of medical treatment: medical treatment for humans and medical treatment for animals. Wherever medical herbs suitable for humans or animals are available, I have had them imported and grown. Wherever medical roots or fruits are not available, I have had them imported and grown. Along roads I have had wells dug and trees planted for the benefit of humans and animals. It is not difficult to understand why this complex and extraordinary person managed to conquer much of India and the rest of South Asia and then to walk away from conquest entirely. His ability to conquer lands was matched by the kindness he showed towards his subjects. Even more extraordinary is the fact that he included all animals and plants among his subjects and thus equally deserving of his care. Thus, when he constructed hospitals, wells and way stations all across his empire, he included such facilities for animals as well. He advised his subjects not to cut down forests wantonly, as the ecosystem would be disturbed by such actions. Remember, these recommendations were made two Millennia ago; there are rulers in the present day world who do not understand the value of such actions. When he accepted Buddhism for its teachings of compassion, truthfulness, ahimsa (nonviolence) and respect for all living beings and universal love, he incorporated such teachings in his edicts for the subjects to follow as well. The very fact that he considered his subjects as his children at once attests to his compassionate and caring nature. His eagerness to be a just ruler was always on display. 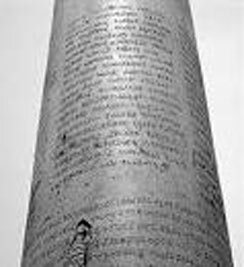 The innovation of inscribing edicts on the pillars that he erected all across the empire as the way to connect to his subjects, and those edicts themselves attest to the emperor’s thinking and his ideals. True to the teachings of the Buddha, towards the end of his life, Ashoka gave away much of his personal wealth; he died peacefully thereafter.